There is really no limit to the extent to which corruption, once it is unleashed, can undermine the stability of the state and organized society. Tax inspectors will extort businesses; the police will kidnap innocents and demand ransom; the prime minister will demand payoffs to make himself available for meetings; aid money will disappear into the private offshore bank accounts of senior officials; the head of state will demand that particular taxes be credited directly to his personal account. Investment will come to a standstill, or, worse, capital flight will lead to disinvestment. In countries where corruption becomes intertwined with domestic politics, separate centers of power will emerge to rival the power of the state. At that point, the chances that the government will actually be able to do anything to control corruption will disappear and the state will mutate into a kleptocracy, the eighth circle of hell in Dante’s Divine Comedy. Which countries have been most successful in lowering the incidence of corruption and thereafter enginnered signifcant increases in growth and better distributional outcomes? What were the main elements of their anti-corruption policies? China and India have had very good growth performance in the last two decades. Both countries have made significant improvements in standards of living. In the case of India the Gini coefficient is relatively speaking low. Yet both countries, especially India, are far from being considered as paragons of virtuous honest governance. Are we missing something? More broadly, can you construct a model and theory of corruption with robust explanatory and predictive powers and amenable to rigorous empirical validation? If yes, then it could guide the allocation of resources of the world bank. Thank you very much for this article. Well articulated. Even after so much destruction of economies and the poor in the developing world, there are still some who believe that corruption is either not a big issue or is just the 'cost of doing business'. Glad to see that there is yet hope in the world for those that believe that corruption is at the heart of the challenges developing countries face. Once you address this issue, I think you would have solved 80-90% of the problems many developing countries face. What policies, what government actions, really, genuinely work to discourage or root out corruption? Important to note, the United States suffered throughout the Nineteenth and Twentieth Centuries from widespread governmental corruption. Why did corruption not prevent the United States from accumulating capital and improve labor productivity at a faster rate than most other countries in the world? Were there instances in which corruption actually proved useful or helpful to development? 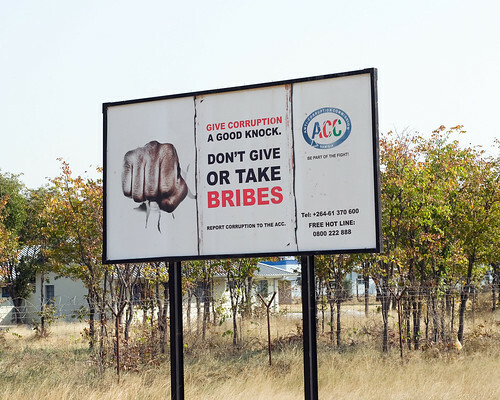 The question of what to do about corruption is the subject of my next blog. I will ask you, therefore, to be a bit patient. Your question is obviously critically important. I would not argue that corruption is helpful to development. Economic growth depends on many factors and some of these may matter for some countries at some periods of time more than the (negative) presence of corruption. Two recent examples that come to mind are massive urbanization in China over the past 2-3 decades, which has been an engine of economic growth, notwithstanding the fact that the country has serious issues with corruption. Russia and other commodity producers had a good growth performance in the decade prior to the 2008-2009 global financial crises, despite the fact that they also have huge issues of corruption and other institutional weaknesses. As a national of a country which made the news headline in 2012, I assure you that no country has witnessed the negative consequences of corruption more than mine. We went from a widespread corruption to organised crime and the collapse of the state. But, even after the crisis, the elites are doing business as usual because few of them have been affected by the crisis. Why ? They have already invested the fruits of their bribery in Western countries, in real estate, in financial products just to name a few. What will be their incentive to be honest if they can have a shelter in other countries when war breaks out in their own country ? Will they be concerned about the collapse of the education system if they can afford to send their children in the best schools in America ou Europe ? Will they care about the healthcare system if they can have the best care whenever they want in the western countries ? Why change the system if they can easily extract the money from their poor country and live the living standard of the developped countries ? There is no incentive to do so. They keep on maintaining the system by the use of violence, bribery, intimidation and lying. The new government works hands in hands with the old one. And the cycle goes on. Can't wait for that blog Augusto, because my despair levels are on the rise and threatening to swamp me! Our current government is working hand in hand with the Big End of Town, subsidising fossil fuel mining at the expense of all eco-friendly, green alternative development, slashing marine parks and reserves, slashing public health and education funding in favour of privatisation, targeting the vulnerable and already disadvantaged for funding cuts, even halving pay rises to our armed forces while deploying them in some of the most dangerous war zones in the world. Yet there is no move to cut their own salaries and retirement benefits which cost the taxpayer in the region of $1 million per retired politician per annum! This government is unashamedly a follower of the feudal philosophy, some are born to rule; the rest are born to serve, thereby increasing the gap between rich and poor. Last but not least, their treatment of asylum seekers has achieved world wide condemnation because it is inhumane and utterly appalling. All these measures are purportedly to fund a budget deficit which is not massive by world standards or considered so by global economists. We were once considered to be the 'lucky country'. I think that reputation has been completely shattered in the last couple of decades. And it bodes ill for countries less rich and 'democratic' that mine. It is very informative and can greatly help lessen corruption.